What is synovitis in runners? Today on the Doc On The Run Podcast we’re talking about synovitis in runners. This week I got a couple of calls from runners who had various different forms of foot pain and they both said the doctor they saw said they had a condition called synovitis. They were both understandably confused because neither one of them really understood what “synovitis” really means. Whenever you hear a word that ends in “-itis,” it means you have inflammation of that specific tissue. “Tonsillitis” means you have inflammation of the tonsils. “Appendicitis” means you have inflammation of the appendix. And “synovitis” means you have inflammation of the synovial tissue. This is the stuff that lubricates and nourishes the cartilage on the inside of your knee joint, your ankle joint and all the other joints in your body. This fluid not only helps to lubricate the joint it also nourishes and keeps the cartilage healthy. On the inside of the joint you have this soft squishy tissue, called synovial tissue, that makes that lubricating fluid. Sometimes you may hear it called synovium. Synovium and synovial tissue are synonymous. They’re both the same thing but they are different terms your doctor may use interchangeably to further confuse you. It probably makes sense that anywhere you have lots of movement you need some kind of lubrication to reduce friction. The most obvious place for this is in your joints like you’re ankle joint and your knee joint. If you injure one of your joints and you stretch the joint capsule that surrounds the joint and holds in the lubricating fluid, you also stretch the synovial tissue that lines that joint. That synovial tissue may then become inflamed and swell up. Synovial tissue has lots of nerve endings in it. If the synovial tissue is swollen it expands inward. The ends of the bones forming that joint may pinch the swollen synovial tissue as you move the joint when you walk or run. So if you roll your ankle and then it is still hurting when you run a few weeks later you might go see your doctor. If you stretched the fibrous joint capsule surrounding the ankle and you also stretched the synovial tissue, then it may be tender when the doctor pushes that tissue into the joint and moves your ankle joint around. The joints are only one of three places in your body where you have this synovial tissue. You also have synovial tissue lining the inside of any tendon sheath or bursa. The tendons are the cables of collagen that connect the muscles to the bones. Anytime you move any structure in your body it’s a tendon that pulling that structure to move it. Hold your hand out in front of you and look at the back of your hand. Now, make a fist. You may see some lines on the back of your hand going from your knuckles converging toward your wrist. Those are extensor tendons that move your fingers. Now, if you open your hand with your fingers spread apart and then repeatedly make a fist you’ll see those lines moving. 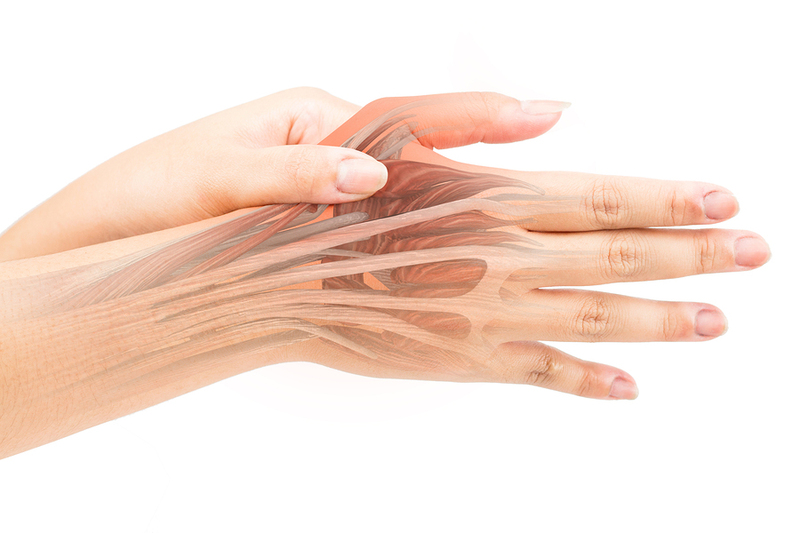 Every time your fingers move straight out the tendons pull up your arm across your wrist. As you make a fist, those extensor tendons move back out away from your arm past your wrist as your fingers pull the tendons around the knuckles. Those tendons are moving a long distance when you extend your fingers and then make a fist. And the only way they can move without friction is by having some lubricating fluid around them. Of course, you have to have something that keeps that lubricating fluid in place. What keeps the lubricating fluid, the synovial fluid, around those tendons is a tendon sheath. A tendon sheath is basically just a tube lined with, you guessed it, synovial tissue. Synovial tissue lines the inside of that tendon sheath and continually makes a very small amount of synovial fluid that lubricates the tendon, letting it glide smoothly without moving the tissue surrounding the tendon. That’s why the skin on the back of your hand doesn’t move very much when you move your fingers. In most cases of tendon injuries in runners the initial pain and inflammation is not really true tendinitis. It’s not really true inflammation of the tendon itself. Instead, most initial cases of tendon trouble are actually inflammation of the sheath around the tendon and pain associated with the swelling of the synovial tissue inside that tendon sheath. This is a form of synovitis. The medical term for inflammation of the synovial tissue within a tendon sheath is tenosynovitis. So your doctor might use either term. The tendon sheath or the tube around the tendon is tough and fibrous. It’s kind of like a garden hose. When you turn on a garden hose it doesn’t expand or swell up like a balloon. Similarly, when you get swelling of the synovial tissue lining the tendon sheath, the sheath doesn’t expand any more than a garden hose would. Unfortunately, instead, the synovial tissue swells inward. That makes the internal diameter of the tube or the tendon sheath actually smaller. But the tendon which is basically just a cable made up of collagen can’t change size or shape. When you get tenosynovitis, or synovitis within the tendon sheath, you have swollen soft squishy tissue on the inside of a tube. Every time you move that tendon it’s squeezing and squeaking its way through that swollen tissue. And that causes a lot of pain. A bursa is just a tiny little fluid filled sac. You have dozens of bursae all over your body. In most cases you can’t even feel them. You only notice a bursa when it becomes swollen. You already understand the need for this lubricating synovial fluid within a joint or surrounding a tendon. But why would you need a little fluid filled sac anywhere? Hold your arm out, straight in front of you. Put your other hand on your elbow. Notice how much the skin moves over your elbow. Now, while your arm is still out in front of you, put your hand on top of your forearm. Feel the difference between how much the skin moves on top of your forearm versus how much the skin moves on your elbow. Why is there so much of a difference in how much the skin will move? Well obviously when you move your arm up and down, bending the elbow, the skin on the back of the elbow has to move a lot. So you have a bursa or a little lubricating fluid filled sac in between the bone and the skin that allows that skin to move without any friction or binding. A good way to explain a bursa is to visualize a tiny little zip lock bag. Put a few drops of olive oil in it, squeeze out the air and seal it shut. Now, if you put that bag between your hands and move back and forth it moves with almost no friction at all. That’s what a bursa does in your body. It helps facilitate movement and decrease the amount of friction between tissue planes. You also have a bursa on the outside of the knee that can become inflamed when you get iliotibial band syndrome or IT band issues. You have lots of these little fluid filled sacs in your shoulder, because there’s a lot of motion happening in your shoulder. There are even tiny little bursae in the ball of the foot at the base of the toes. If you do something that irritates the bursa it can swell. If the bursa swells it stretches the synovial tissue on the inside of the sack and it becomes painful. So basically bursitis is just synovitis within a bursa. Because this bursa is located close to the Achilles tendon, it is sometimes misdiagnosed as Achilles tendonitis. There’s also a bursa on the bottom of the heel which can become inflamed. Because it’s on the bottom of the heel it is quite often misdiagnosed as plantar fasciitis. When I lecture on runners heel pain at medical conferences, I often notice doctors suddenly picking up their pens and starting to scribble notes as soon as I start talking about this condition and how to tell the difference between plantar fasciitis and bursitis. Just today I was speaking with an athlete during a Virtual Doctor Visit Skype consultation. She said that she had just seen her physical therapist and was told that she definitely had plantar fasciitis. The reason she wanted to talk to me on Skype for a second opinion was that she had been doing all of the stuff she was supposed to do for plantar fasciitis, but she was not getting better. She showed me her foot using her Webcam. When she pointed out where it was hurting it was clear to me it was much more likely she had bursitis and definitely not plantar fasciitis. So then it made sense why she wasn’t getting better. Yesterday I was doing a phone consultation for a patient who hasn’t been able to run for months. He was diagnosed with a Morton’s neuroma. He even had a couple of injections to try to heal it. He also tried neuroma pads and several different treatments that should help a neuroma, but he wasn’t getting any better. I ordered and ultrasound exam of his foot which actually showed that he did not have a neuroma at all. Instead he actually had inflammation of a tiny little bursa in the ball of the foot right next to the nerve that causes the symptoms of a neuroma. The little bursa was inflamed and swollen. The radiologist actually measured it as 3 mm x 5 mm. Now that may not sound very big to you but this little fluid filled sac was taking up a lot of space in a very small area. So the swollen bursa was actually pushing on the nerve and then causing the same sort of radiating tingling pain that one would expect with a neuroma. Then it made sense why he had been misdiagnosed with a neuroma. Because we were able to figure out he doesn’t actually have a neuroma, it suddenly made sense why he wasn’t getting better with the treatments that would normally work for a neuroma. In all three of these cases, you have inflammation of the synovial tissue. 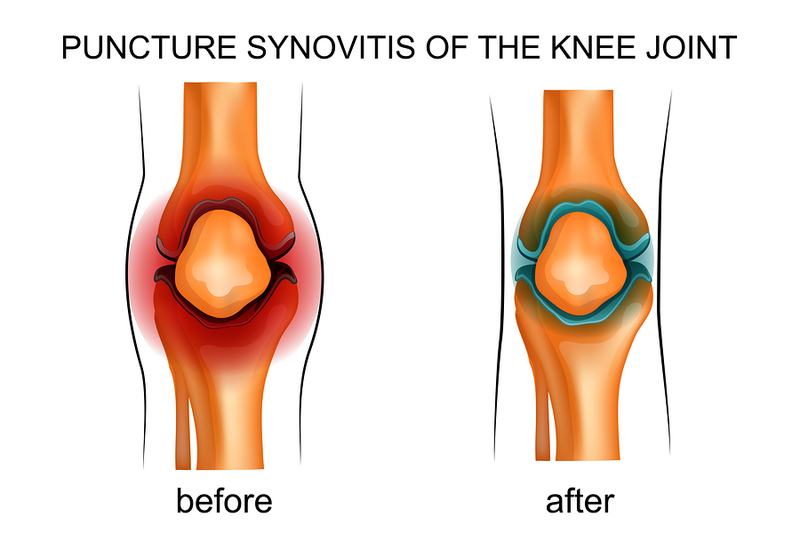 We have synovitis inside a joint. We have synovitis inside a tendon sheath. And we have synovitis inside a bursa. When any tissue becomes inflamed, it becomes swollen and painful. In those cases you have to do something to reduce the inflammation to get it to calm down and heal. You have to calm down the right tissue. As I have talked about many times before, you have to make sure that you understand the true cause of the problem. You have to make sure you have the right diagnosis. 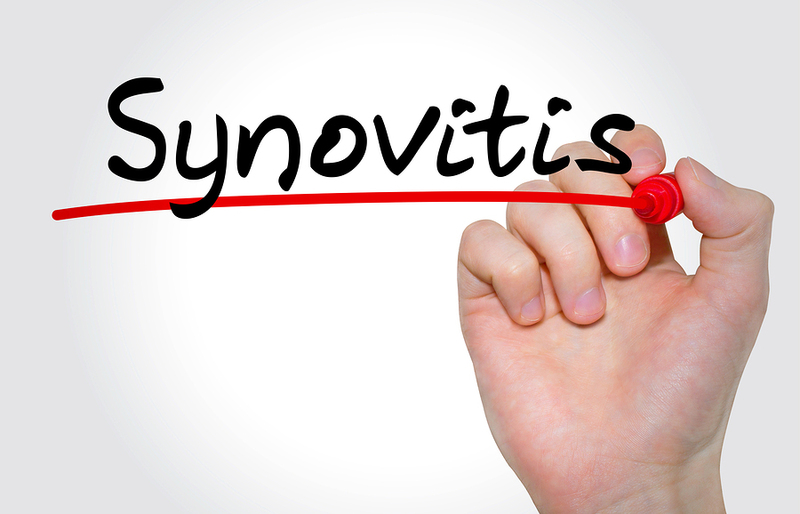 All the various synovitis conditions are relatively easy to treat, at home, on your own even without the help of the doctor. But only if you know exactly what’s causing the problem. So if you see a doctor, your doctor makes a diagnosis and you are doing all of the stuff your doctor said to do, and you’re not getting better, you might be treating wrong problem. If you are not confident in your doctor’s diagnosis, get a second opinion with an expert on running injuries. If you don’t want to go see another doctor you can also work through it on your own with some of the self-diagnosis books or video self-diagnosis courses we created. Just remember, the sooner you get the right diagnosis and know what to do, the sooner you will get back to running.